The Company is a major subsidiary of Tianneng Battery Group Co. Ltd, which was founded in 1986 under the name of Changxing Storage Battery Factory. It had since become a leading supplier of motive batteries for electric vehicles in China after two decades of development. Currently, the principal activities of the Company are production and sale of electric bike motive batteries, electric car motive batteries and new energy storage batteries sold under its "TIANNENG" brand. The Group has collaboration with several automobile manufacturers to speed up the research and development of motive batteries for pure electric cars. The Company is also implementing a sales and marketing strategy focusing on key new energy areas to accelerate the development of its wind and solar power storage battery business as well as its lead recycling business to support the national policy of energy saving and creating a low carbon economy. Since its establishment, "TIANNENG" has been the dominant brand in the China motive battery market and was also one of the renowned brands for all motive batteries. It has captured many awards and certificates, including the "National Well-known Trademark" and the "Zhejiang Prominent Brand Product." The Group was also acknowledged as the “Chinese Best Brand of Motive Battery” by Frost & Sullivan during the period from 2008 to 2011, “The Most Reliable Battery Brand for Electric Vehicles” and “Outstanding Contribution to the Promotion of the Electric Vehicles Industry in China” by CCTV.com. The Company has six production bases, namely (i) Meishan Tower; (ii) Wushan Town; (iii) Shuyang County; (iv) Wuhu City; (v) Jieshou City; (vi) Puyang City. 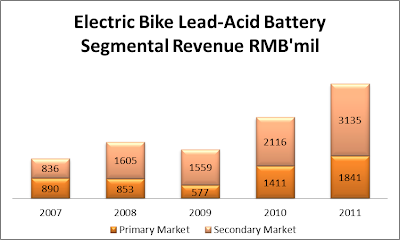 The annual production capacity of electric bike lead-acid motive battery products was approximately 65 million units in 2011. Dr. Zhang Tianren is the founder, president and chairman of the Company and is the key driver of the Company in terms of business strategy and management. He is the major shareholder of this Company with a 36.55% equity stake. 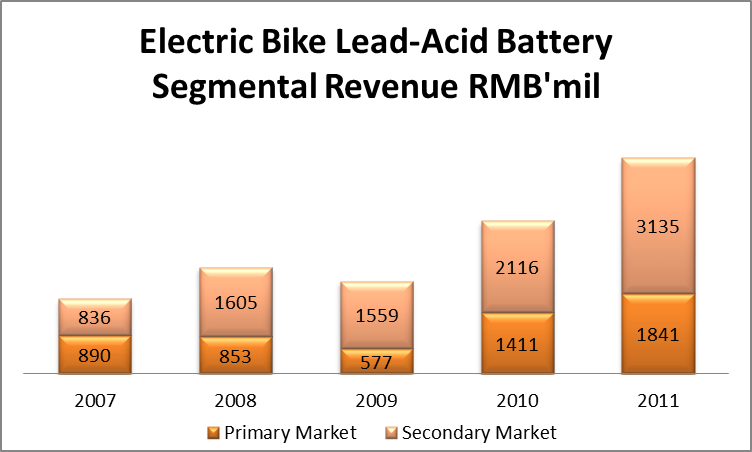 Majority of the revenue comes from the electric bike lead-acid battery segment which accounted for more than 90% of the Company’s total revenue. The second largest contributor is pure electric vehicle (EV) battery segment which contributed 5.1% of total revenue in 2011, up from just 0.6% in 2009. The remaining revenue was contributed by Nickel Hydride (NiMH) and Lithium Battery segment coupled with storage battery segment. The Company controls the largest market share of 26% in 2011, followed by Chaowei, a listed company which controls 24.5% of the market share. The next three top players accounted for 15% of the market share while the remaining is contributed by other peers. The company plans to expand its production capacity from 65 million units in 2011 to 80 million units in 2012 and 106 million units in 2013 to cater for demand from the primary and secondary markets. Defensive secondary (replacement) market the largest revenue contributor: The secondary market for electric bike lead-acid battery is the largest contributor to the Company’s revenue, accounting for 57.6% of total revenue in 2011. Typical lead acid batteries can be recharged 500 times and last about 12-18 months. During the lifespan of E-bike of about 10 years, batteries will be replaced at least 7 times. Thus, demand for replacement batteries will be defensive. This was further evidenced by the secondary market sales which only declined 2.9% as compared to 32.3% decline in the primary market during the economic downturn in 2009. Primary market for electric vehicles to benefit from severe road congestions and air pollution: Owing to the severe traffic congestions in major cities in China coupled with serious air pollution which is reaching dangerous levels recently, China is pushing for cleaner vehicles on the road, of which electric bike industry is a major beneficiary. In addition, users are offered cash incentives by the Chinese Government. 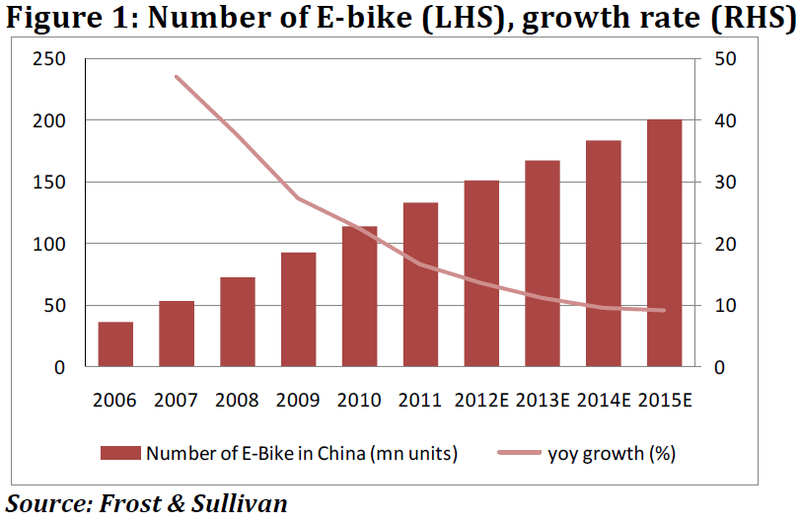 In 2011, there were around 130 million electric bikes on the roads in China and this number probably increased to 150 million in 2012. According to China Dialogue, China expects 500mil electric bikes on the road and annual production of 75mil by 2020. Lead acid technology dominates E-bike battery industry: Lead acid battery technology dominates the E-bike battery market with market share of 91%, while the remaining is held by Li-ion (7%) and NiMH (2%). 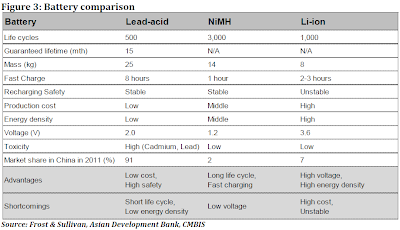 The popularity of lead acid is attributed to its lower cost, high reliability and recyclability, which more than offset its lower power output and heavier weight. Frost & Sullivan forecasted lead acid battery revenue will grow at CAGR of 20% till 2015. The following table is a comparison among the three battery technologies for E-bikes. The Company is currently in collaboration with 106 famous auto corporations including some of the big names such as SAIC Motor, Chery Automobile, Wonder Auto, Kandi Auto, Zotye Auto and Shifeng Group for development and sales of motive battery for electric vehicles (EV). Chery is producing low-speed EV in small volume using Tianneng’s lead acid battery whereas Shifeng has a very strong presence in low-speed EV market in Shandong. Consequently, these collaborations make Tianneng the largest low-speed EV battery maker in China. In addition to its existing lead acid battery technology, Tianneng is aggressively embarking on research and development on NiMH and Li-ion batteries. 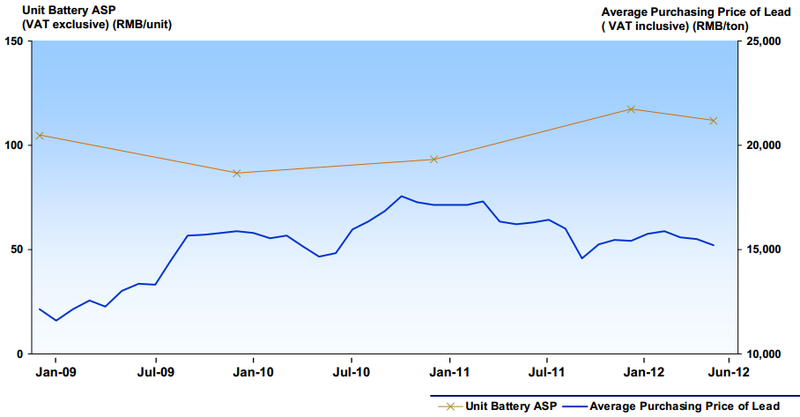 Sales from EV motive batteries accounted for 5.1% of total sales in 2011, an increase of 135% year-on-year. Sales of EV motive batteries are projected to rise with the expansion of the company’s production capacity from 0.8mil units to 1.5mil units in 2012 and 2.0mil units in 2013. Mr Zhang Tianren stated that the success of the electric bike industry might be replicated in the low speed EV segment in the future with the Chinese government’s intention to make China the top electric vehicle producer in the world by 2020. The table below shows Tianneng’s expansion plans for its EV battery production capacity. The Company embarked on development of storage battery for solar and wind power generation and successfully created storage battery with long lifetime and huge capacity. These solar and wind power generation is used in street lamp and traffic light systems equipped with LED lighting and lead gel storage battery. This segment contributed 0.8% of the total revenue or RMB43.5mil in 2011. The Company plans to expand its capacity from 100,000 units in 2011 to 200,000 in 2012 and 500,000 in 2013. Market leader becoming stronger after industry consolidation: The Chinese government has embarked on inspection and rectification works on the lead battery industry across the whole of China in 2011 and imposed stricter regulations for lead acid battery makers. Consequently, among the 1,930 lead battery makers, over 50% of them were under temporary suspension whereas another 30% were banned, partly owing to the limited resources available to smaller companies to comply with the strict regulations. This would bode well for Tianneng as the market leader as the Company could further advance its market share via organic expansions and potential M&A opportunities coupled with having greater control over the market price of its products. In May 2012, Tianneng acquired Zhejiang Huayi Power Co Ltd for RMB60.78mil to expand its production capacity. In addition, the Company is in the midst of another acquisition of 70% of Target Company at RMB47mil. There is likely to be more M&A acquisitions over the next two to three years owing to small-scale manufacturers being unable to compete with Tianneng’s competitive pricing and economies of scale. Recycling business to mitigate lead price fluctuation: Approximately 64% of production costs of lead acid batteries is attributed to electrolyte lead, thus production costs are susceptible to the volatility of lead price. To mitigate this, the Company set up a recycling plant in Wushan Changxing, Zhejiang province, the most advanced recycling plant to date in China which was fully operational in Oct 2012. The plant could process 150,000 tons of used lead acid battery and 100,000 tons of lead. According to management, this plant could generate RMB100mil of net income annually as the recycled products could be used as input to its production. The company is constructing a second recycling plant in Henan which will be completed in 2014. Besides, the Company has a strong distribution network over the country to recollect used lead acid batteries. This will bode well for the Company as China’s recycling industry is fragmented and lack of recycling channels. Thus, Tianneng is better positioned than its peers in terms of alleviating lead price volatility. 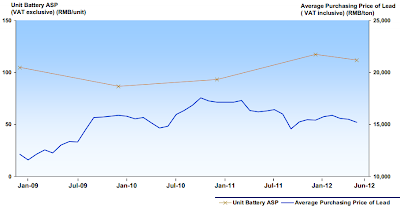 The following graph shows the average selling price of Tianneng’s lead batteries and the average purchasing price of lead. Risks of more stringent regulations by the government? The Chinese government seems to be taking a more serious stance towards pollution as evidenced by its introduction of rectification works on lead acid battery makers in 2011. 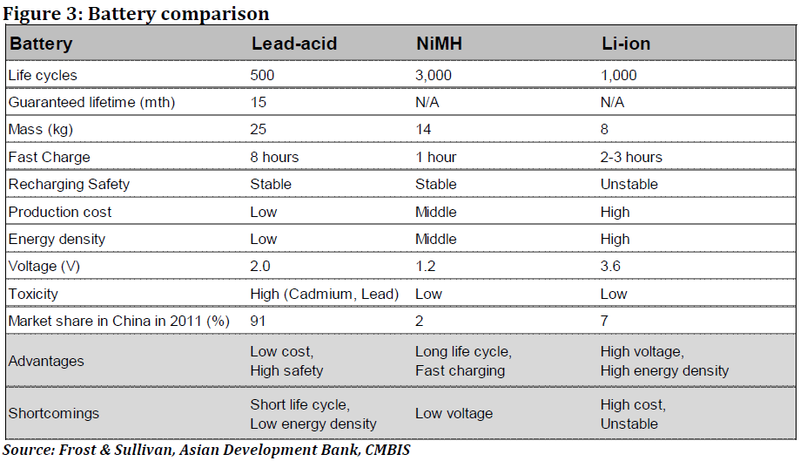 In March 2012, Ministry of Industry and Information Technology together with Ministry of Environmental Protection released “Consultation Paper of Lead Battery Industry Entry Requirements” (“Entry Requirements consultation”) which made clear that the Chinese government shall further uplift the operating threshold of existing and newly-built lead battery projects. This could put further pressure to lead acid battery makers. Nonetheless, it is interesting to note that despite the rectification works implemented in 2011, Tianneng’s margins expanded instead. In addition, Tianneng’s board members are part of the committee which created the “Entry Requirements for Lead Acid Battery Industry”. The Management stated that the Company will comply with all the regulations as it is the market leader and will upgrade its production facilities to meet all the requirements by 2013. This should help alleviate some of the policy risks faced by the company. Valuation remains attractive: The stock is currently trading at PER 2013 of 5.2x as compared to its 5-year historical average of 8.7x. In addition, the Company is giving out commendable dividend yield estimated at 5.5% in 2013. The share price is still undervalued currently, owing to investors’ skepticism over the long-term growth prospects of lead acid battery and policy risks by the Chinese government. 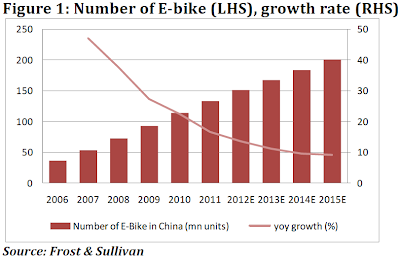 Nonetheless, backed by its strong growth prospects in the electric bike and EV markets, recycling plants which could lower production costs coupled with its low valuation, a PER of at least 7x should be attributed to its 2013 EPS, implying a fair value of HKD7.03, an upside of 34%. Over the past few months, Tianneng’s share price had increased in conjunction with the strong run up in HSI. The stock might have some consolidation if HSI experiences profit taking due to the surge in HSI. HKD4.90 seems to be a good entry level. Many international funds are into this stock, including Blackrock, Schroders, Vanguard and Lumiere (One of the best performing equity funds in the whole world). It's a stock worth watching. References: Tianneng, Maybank, OSK, CMB International, UOB Kayhian, Sunwah Kingsway, Frost & Sullivan, Bloomberg etc.